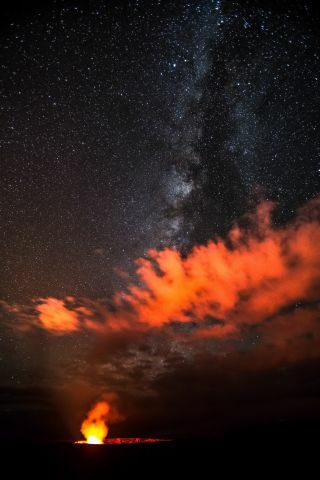 Quek ZongYe of Singapore captured this image of the Milky Way glowing over Hawaiʻi's Halemaʻumaʻu Crater on Sept. 12, 2012. The image was released on Oct. 14, 2013. Astronomers from all over the world are getting together for two weeks to discuss the newest and most exciting discoveries in space science; they may also sneak in some surfing and hula lessons, because this astronomy meeting is taking place in Honolulu, Hawaii. More than 3,500 astronomers and space scientists from 75 countries are expected to attend the XXIX (29th) International Astronomical Union (IAU) General Assembly meeting, being held from Aug. 3 to Aug. 14. The two week meeting will be chock full of talks on all kinds of out-of-this-world science. In addition, IAU members are expected to announce the winning names for 47 objects in 20 newly-discovered exoplanet systems (which are given official but technical-sounding names when they are first identified). The names were voted on by the general public. The IAU is a major force in the worldwide astronomy community. Its mission is to "promote and safeguard the science of astronomy in all its aspects through international cooperation," according to the IAU website. Every year the IAU sponsors nine international IAU Symposia and published the IAU Symposium Proceedings. The IAU is also in charge of many important decisions related to astronomy, such as giving official names to space objects and features on space objects. (So, for example, it will be the IAU that confirms new names for exoplanets. The IAU will also verify names for the newly discovered features on Pluto, which have already been given "unofficial" names by the New Horizons team that discovered them). It was also the IAU that made an official decision in 2006 to recategorize Pluto as a dwarf planet. The decision was preceded by months of intense debate over the official definition of a planet, which Pluto ultimately did not fulfill. The IAU is expected to announce the final names for the newly-discovered exoplanet systems in a media briefing on Tuesday, August 11. In April, the IAU hosted a contest that invited clubs and non-profit organizations to suggest names for objects in 20 newly-discovered solar systems. Five of the parent stars already had common names, which left 15 stars and 32 planets in need of new titles. The deadline for proposals was June 1. Following the selection of candidate names from the contest, the IAU invited the general public to vote on the final names. The XXIV General Assembly of the International Astronomical Union is being held in Honolulu Hawaii, from August X to August X. The IAU has 11,275 members in 96 countries. The General Assembly meeting takes place every three years, and was last held in the United States was in 1988. The American Astronomical Society (AAS) is the host organization for this year's meeting. No press conferences or meeting events will be webcast. "Participants at the General Assembly in Honolulu will address key topics in contemporary astronomy and assess the latest scientific progress in a number of specialized areas," according to the IAU website. "With six symposia extending over several days, 22 multi-session focus meetings, nine IAU Division meetings, dozens of IAU Commission meetings, and the first-ever daily general poster sessions, the XXIX General Assembly’s scientific program will be the broadest in the union’s history." The Hawaiian scenery is difficult to turn away from: the rich green foliage, the miles of beaches, and the brilliant sunsets are some of the most beautiful in the world. But at the IAU meeting, scientists shouldn't have trouble peeling their eyes away from the scenes outside to look at the newest views of stars, galaxies, nebulas and other space phenomena.